Tuesday’s national, state and local elections could dramatically affect just about every area of political and economic policy in our communities, our nation and our world. That’s why it’s so important to VOTE this Tuesday, November 4. California’s polls are open from 7am to 8pm, and state law allows you to take 2 hours off work to vote. Find your polling place here. UPTE’s election recommendations are here. 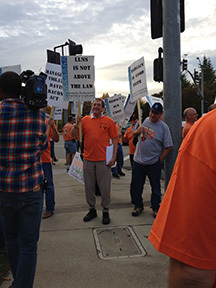 Skilled trades workers at Lawrence Livermore National Lab, such as electricians and plumbers, were joined by supporters at a picket last Thursday over what they say are wage fraud issues and unsafe conditions that endanger the surrounding community, reports the San Jose Mercury News. UPTE-CWA represents the unit of 200 employees, who have been without a contract since January, are considering a strike. California governor Jerry Brown and the California Health and Human Services Agency announced last Friday that all five University of California medical centers had been designated “priority hospitals” to treat patients confirmed with Ebola. But while San Diego’s PBS station ran this piece on UCSD med center’s preparedness, unionized nurses who work at UC expressed concern that the system wasn’t ready, according to reports on San Diego’s NBC affiliate, the Los Angeles’ ABC station and in the Daily Cal. Nurses represented by the California Nurses Association demonstrated outside UCSD, UCSF and UCLA last week, to call attention to needed safety and training procedures (see this video by Channel 6 and this radio interview by KPCC public radio). A thoughtful essay entitled “The New Normal” on what it means to work at UC after decades of budget cuts and structural changes, written by UCSB English professor Chris Newfield, has hit the internet. The essay is adapted from a talk given by Newfield and his co-author, UCLA History professor Michael Meranze, sponsored by the Berkeley Faculty Association. “You guys need a union” was the sentiment in the room by the end of the presentation, reports Newfield, a subject he invites not yet unionized UC employees to seriously consider. As UC Berkeley marks the 50th anniversary of the Free Speech Movement with dozens of events and exhibitions, it’s on the editorial pages of the New York Times and elsewhere over disinviting a graduation speaker, satirist Bill Maher, host of HBO’s “Real Time.” After Maher’s recent remarks on Islam sparked anger, student groups petitioned to block him, and the group that invited him rescinded their invitation, according to Inside Higher Ed and the Los Angeles Times. Berkeley’s chancellor overruled the group, citing Maher’s right to free speech. Maher response to the controversy on his show this week is covered in the Huffington Post.